Spooky season is officially here! This is seriously my favorite time of year! The temperature starts to drop (even here in LA it’s a chilly 70 degrees ? ), the candy starts to flow, calories don’t count, and the parties never seem to stop! Unfortunately, Janette is going to be out of town for most of the month. We decided to have our little family Halloween movie night before she left. I gave her the task of making the movie and TV show playlist, while I would handle the snacks. I’m pretty serious when it comes to my movie snacks. I love making a popcorn snack mix appropriate for the occasion and often stress about getting it just right with the perfect balance of flavors. 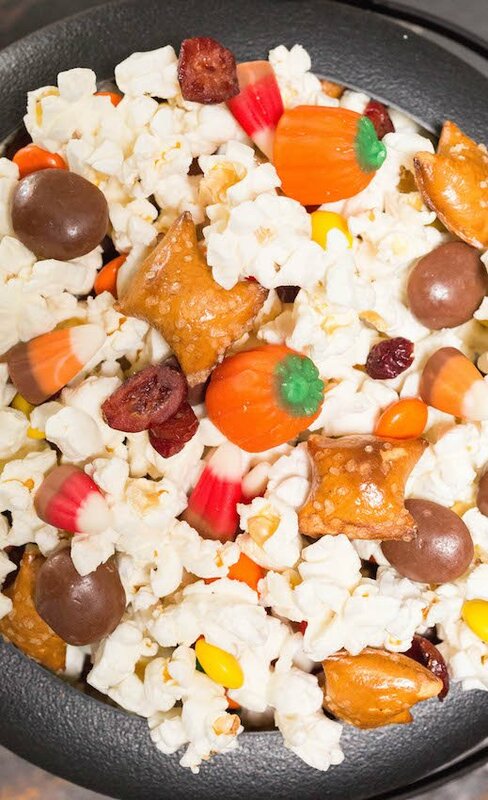 I thought about how to create the best Halloween movie snack mix for weeks. It’s been on my mind since the end of August! I decided to put my nose to the grind and do the tough job of tasting dozens of flavor combinations. 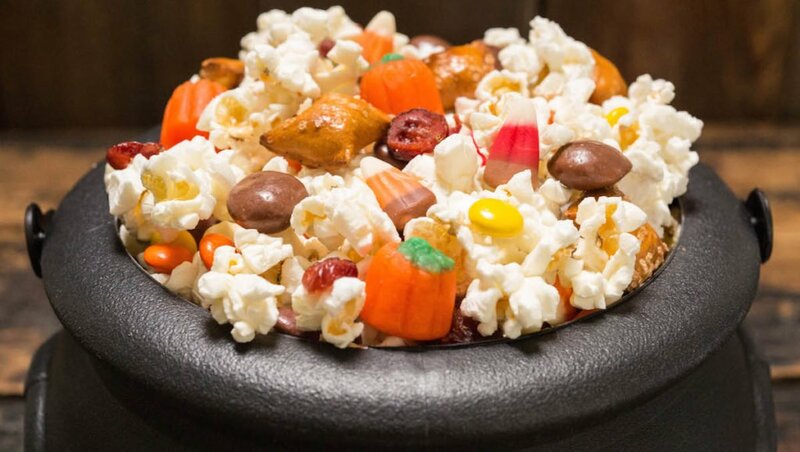 After all that hard work, I feel confident saying that I have created a delicious Halloween snack mix any ghost or goblin will enjoy! What did I put in my Halloween snack mix? Well, let’s start with the base. Popcorn. But not just any popcorn, specifically Kettle Corn. The slight sweetness and hint of salt will set us up nicely to build the rest of the mix. Next comes all the candy and treats we want to add. This part was hard. There are so many things I wanted to add! Milkduds are the most classic addition to popcorn and I knew I wanted some caramel in the mix, so its addition was a no-brainer. When I think of Fall candy, a few things pop into my mind: candy corn, candy pumpkins, and Reese’s. All of those were an immediate “yassss!’. The pretzels were thrown in to add some creamy, savory peanut butter flavors and a little extra saltiness. Cranberries are undeniably the fruit of fall and adding them would add a welcome bit of tang. It turned out great and we shoveled handful after handful into our mouths while watching our favorite Halloween movies and tv episodes. 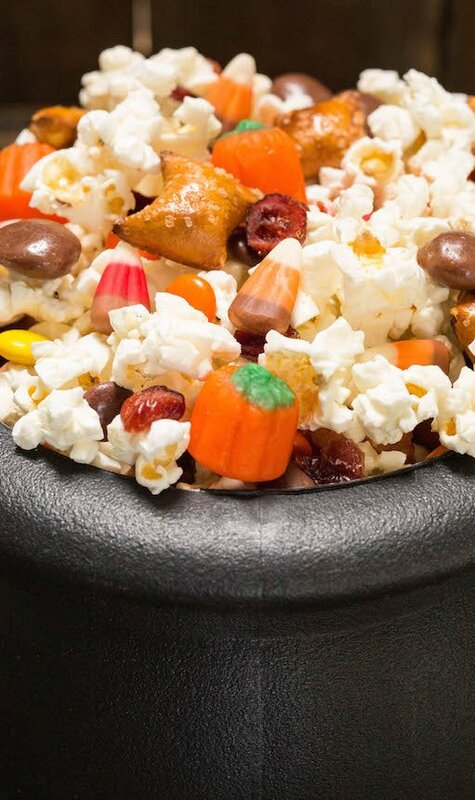 What does your family like to watch while munching on Halloween snacks? Add the popped kettle corn to a very large bowl. Allow to cool. Next, add all of the other ingredients. Toss very gently with your hands. Serve immediately or store in a Ziploc bags until ready to consume.